CHICAGO (CNS) — Chicago-based Catholic Extension has launched a crowdfunding campaign to raise $25,000 for a new emergency migrant shelter at the U.S.-Mexico border in Laredo, Texas. The national Catholic organization, which raises money on behalf of poor Catholic churches in the United States, started an emergency fundraiser for San Francisco Javier Church April 1. The shelter opened its doors to migrants in late March as an urgent response to an influx of asylum-seekers in the area. The first $10,000 has been sent to the church from funds raised from Catholic Extension in the first two days of the campaign. The Diocese of Laredo, which includes San Francisco Javier Church, is urging people to continue to donate to the campaign during this time of crisis. The Diocese of Laredo estimates it is providing food, shelter and support to as many as 500 migrants per day. Catholic Extension said the crowdfunding campaign has already garnered nationwide support, with donations coming in from Bismarck, North Dakota, to Normandy, New Jersey. Many in-kind donations are helping to clothe and feed migrants, however, donations of money are needed to pay for other urgent operational needs such as security, utilities and transportation. The shelter cares for migrants who have requested asylum and are in the country legally. They have been detained, processed and released by immigration officials, and are awaiting their asylum hearing dates. Volunteers from the shelter pick up the migrants at a nearby bus station, where U.S. Immigration and Customs Enforcement releases them after they have been processed. Primarily from Honduras, Guatemala and other Central American countries, these migrants typically arrive in the United States with no food, no money and no way to reach out to family or connections for support. Rene Gonzalez, director of the Laredo Diocese’s Office of Stewardship and Development, called the situation a “humanitarian crisis.” Through food and safe shelter, he said, the shelter is providing “hope and compassion” to all who need it. San Francisco Javier Church is located in a low-income area and has deep ties to the local community, according to Catholic Extension. The crowdfunding campaign website states the shelter provides “food, shelter and emotional support” to “our brothers and sisters on the margins” and encourages visitors to donate and share. Since its founding in 1905, Catholic Extension has supported the work and ministries of 90 U.S. mission dioceses. It supports the construction and repair of churches, and invests in education, training and support of seminarians, priests, sisters, deacons and lay leaders in those dioceses. 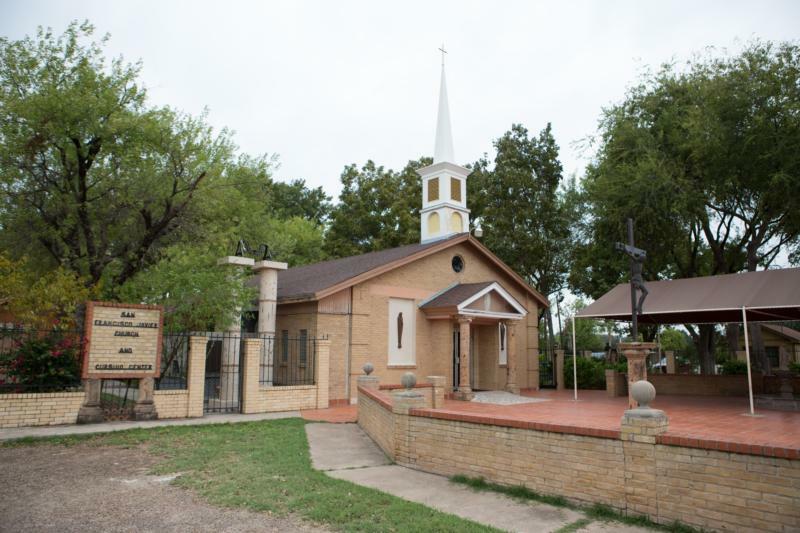 The organization’s funding history in Texas dates back to 1906 with a pair of grants to help build churches in the towns of La Lomita and Uvalde. Editor’s Note: More information about the campaign and how to donate can be found here.